Vintage Home & Garden: giveaway alert...hurry the clock it ticking! Only hours left to get in on this giveaway, girls! My friend Anita, from the Iowa Junk Gypsies, is doing a fabulous giveaway! 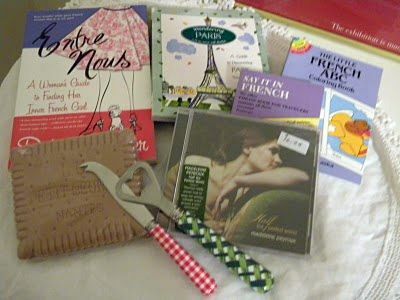 For the love of all things French...get over there and leave your comment to enter! Did you know Anita is fluent in French....and she lived in France...and she teaches French, too! She is hosting a trip to Paris in April! I am hoping to tag along with her...but if you want in, click on the link under her header for more info! Now click on over and check out her blog...leave a comment and you just might win her bag of goodies! Hey- thanks for the shout out. You are the bomb! Wonderful blog. I just found you & I've enjoyed reading it. Happy blogging & Happy 2010! Ohhh la...What a generous give-away! ps Madeleine Peyroux is excellent!